As I lie awake at night and mentally compile a list of recipes I want to share on this blog….and as I scroll through Pinterest and I’m bombarded with pictures of beautiful and decadent looking food, I’m hit with a harsh reality….I AM HUNGRY!!! I’m thinking starting a food blog and a diet at the same time was not a great idea. Today marks one week that I’ve been using Weight Watchers online and so far so good I’ve lost 4 lbs! But is it so wrong that I want to continue to make my yummy sweet treats and rich, savory meals!? I want a cupcake!! I want pasta with cream sauce!! But could it be my new found passion for cooking is the reason I am now faced with the need to lose 40 pounds? You see, not only do I love to cook food…I love to eat it…and I typically only like to make food that I like. I am not ashamed to admit I love junk food and comfort food. Of course, I love a good salad and veggies once in a while, but what is even better…veggies smothered in cheese! Salad with creamy dressing and croutons! Nowadays (luckily for me) there are good recipes that are low fat, low carb, low calorie, etc. and with using the Weight Watchers tools it is easy to punch in a recipe and see how many points it is and it’s actually kind of fun to try to make ingredient substitutions to see if you can lower the WW points value (and still have it taste good!). Of course, nothing tastes as good as the real thing (sugar, butter, whole milk, heavy cream, white flour….ok I need help!) but I think I’ve come up with some decent recipes for those of us who are not blessed with genes to eat anything we want and stay slim. So with that, I am going to provide “slimmed-down” versions of some of the recipes I share on this blog, as well as some others I’ve come up with. The first one is for pizza, since my first post was pizza dough. 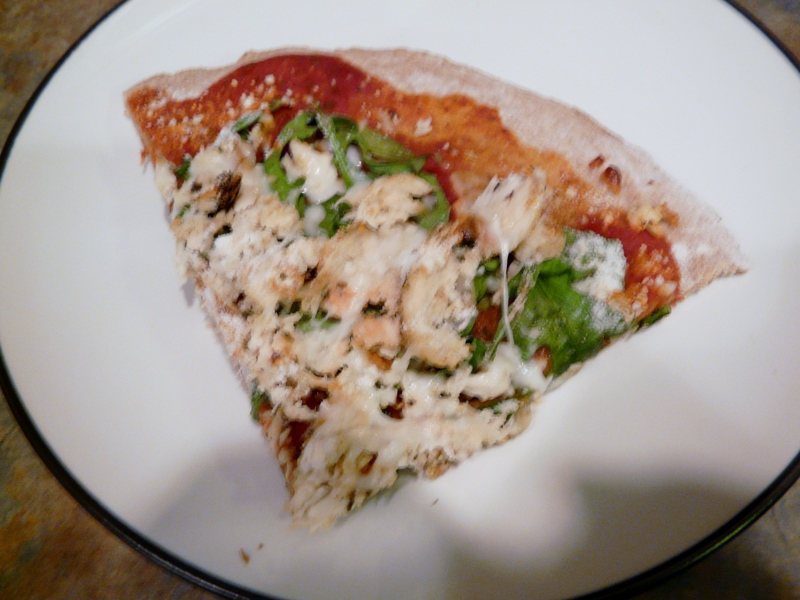 This pizza uses a whole wheat crust and other low fat ingredients. If anyone tries it out I’d love to hear your feedback and advice on how to make it better. It is “diet food” (yes, I am still going to use the term “diet”, even though it is taboo this day in age!) but it’s actually pretty good diet food…however, I’m sure it can always be better! So please share your thoughts! Ok, so here is the recipe. For those Weight Watchers users out there this recipe has a Pointsplus value of 4, and a serving is 1/8 of the pizza. Also, I would suggest adjusting the spices to your own taste. I’ve provided exact measurements, but you may want to adjust things based on your own preferences. Remember, if you adjust the other ingredients (amount of chicken, types of cheese, etc.) the Pointsplus value will change. 2 part-skim mozzarella string cheese, shredded in food processor or blender. 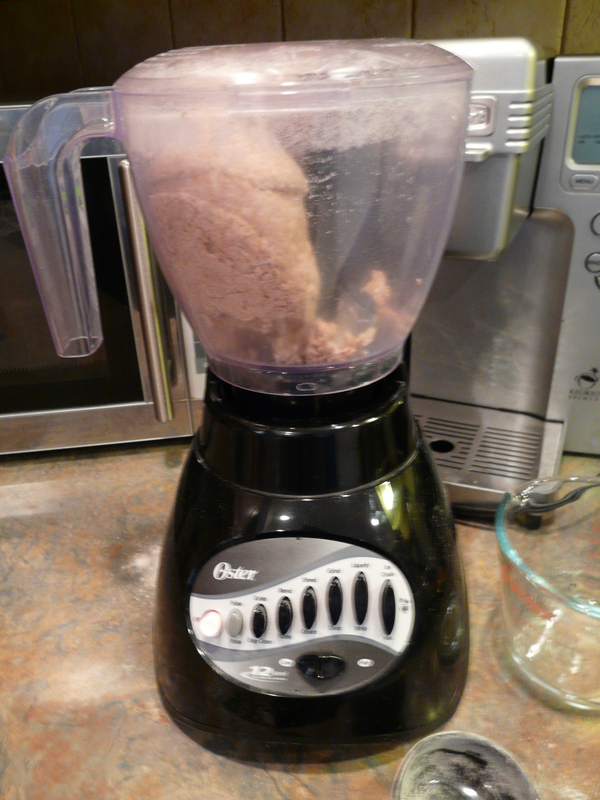 In a food processor, combine 1 ½ cups of the flour, the yeast, sugar, and salt. Pulse one or two times to combine the dry ingredients. Add water and olive oil and process until a smooth dough forms. Poor ½ tbsp. of olive oil into a bowl and place the dough ball into the bowl, turning to coat with the oil. Cover and let rise in a warm, dark place for about 35 minutes. Prepare the sauce by combining the crushed tomatoes, salt, garlic, oregano and basil in a small bowl. 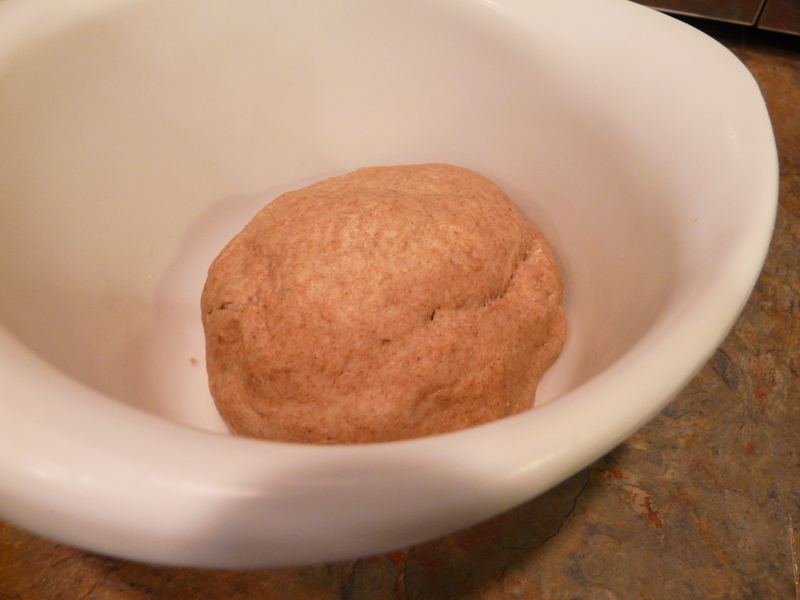 Once the dough has risen, roll it out onto a lightly floured surface. Bake the pizza crust for about 5 minutes in the preheated oven (this will give you a crispier crust). Remove from the oven and allow to cool for a minute or two. 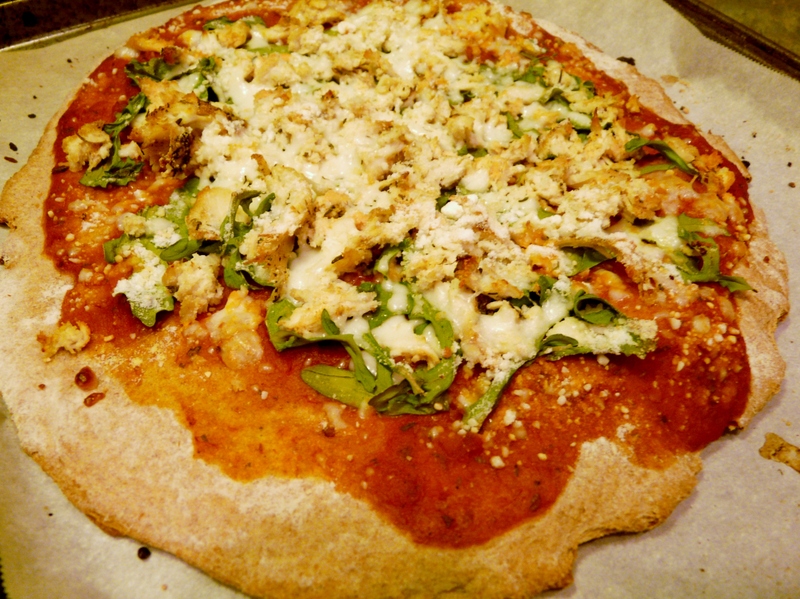 Top the crust with the sauce, arugula, chicken, and cheese, making sure to spread the ingredients evenly over the crust. Bake for 8-10 minutes or until the cheese is melted.